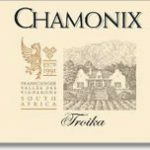 In the 2013 edition of Platter’s Guide, Chamonix was rated Winery of the Year, with four 5 star ratings. It is situated in Franschhoek, high up on the slopes of the Franschhoek mountain, on the left as you enter the town. Gottfried Mocke and his team are recognised as among the top handful of winegrowers in our country. His achievements in the cellar are noteworthy, with great success across a broad spectrum of cultivars. This is a blend of 50 % Cabernet Franc, 38 % Cabernet Sauvignon and 12 % Petit Verdot. The word Troika is a Russian word for a three wheeled cart, and is also the name of one of the award winning horses bred on the farm almost two decades ago. Troika indicates the three noble grape varieties used in this blend. 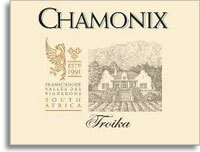 The blend will always be dominated by Cabernet franc fruit grown on the Chamonix estate. The wine has been carefully matured for eighteen months in 60 % new French barriques, which leads to integration of all the component cultivars, leaving a lovely creaminess in the aftertaste. The colour is a deep black-ruby, and the nose is inviting with good depth and fruitiness, reminiscent of fresh cherries laced with fennel and subtle oak. It is this and more on the generous palate, which is deep and complex – a tight wine with a rich core of sappy red berry fruit and great length. We recommend that you mature this wine in a cool cellar ( <18⁰C ) until at least 2020 for optimum drinking pleasure.